The Old Foodie: Miserly Onions. The fabulously wealthy Hetty Green - “The Witch of Wall Street” - died on this day in 1916 at the age of 80 years, leaving a legacy of over a hundred million dollars to her children. Hetty was born to money, married money, and very cleverly made money throughout her life (this was at a time when women were not supposed to bother their little minds about such a thing, never mind be good at it.) One thing she did not do well was spend money. Her penny-pinching was an expression of the Christian virtue of frugality (she came from Quaker stock), plain stinginess, or simple eccentricity, depending on the point of view of the teller. Naturally, some of the tales of her meanness related to food, so these are the stories we will focus on today. They are all of the “it is said” variety. Rumour had it, for example, that Hetty would walk any distance to save a few cents on milk or other basics, that she would return berry boxes for the one cent deposit, and that she would ‘cook’ her oatmeal on the office radiator to save fuel. It is also said that on her 78th birthday she attributed her health and longevity to eating baked onions. Hetty could have done worse than develop a taste for onions. They are usually cheap and easily available for one thing. 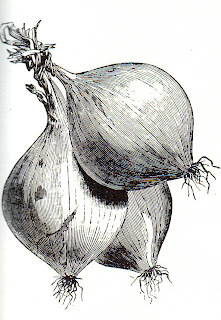 For another, there are many medicinal effects attributed to onions. One late 17th C household manual says of them that they are ‘proper to such as are afflicted with cold vicious Humours, because they procure Sleep, and help Concoction, prevent sower [sour] Belchings, open Obstructions, force Courses, and the Urin, promote insensible Transpiration …. ’, which would make them extraordinarily useful if it is true. Humans have been eating onions of one sort or another since ancient times, and it is almost impossible to imagine cooking without them. It is a rare savoury dish that does not include onions. I remember reading years ago an article by a cook or chef (I don’t remember any name) who said that as soon as he arrived home from work he would chop up an onion or two, and perhaps some garlic, and put these on to gently sauté while he decided what to have for dinner. There is something in that concept. What is surprising about onions, given their long history in the human diet, is that this is their role – as an essential ingredient of a huge number of dishes, not a featured performer. I do not think that we give enough consideration to onions in their own right (I don’t include onion jam or caramelised onions here). There are relatively few historic recipes starring onions, but I have chosen a few for your enjoyment. Beeing peeled, put them into boiling liquor, and when they are boil’d, drain them in a cullender, and butter them whole with some boiled currans [currants], sugar, and beaten cinnamon, serve them on fine sippets [toasts], scrape on sugar, and run them over with beaten butter. Wash, and pare some Potatoes, and cut them in Slices, peel some Onions, cut them in Slices, pare some Apples and slice them, make a good Crust, cover your Dish, lay a Quarter of a Pound of Butter all over, take a Quarter of an Ounce of Mace beat fine, a Nutmeg grated, a Tea Spoonful of beaten Pepper, three Tea spoonfuls of Salt, mix all together, strew some over the Butter, lay a Layer of Potatoes, a Layer of Onion, a Layer of Apple, and a Layer of Eggs, and so on, till you have filled your Pye, strewing a little of the Seasoning between each Layer, and a Quarter of a Pound of Butter in Bits, and six Spoonfuls of Water. Close your Pye, and bake it an Hour and a Half: A Pound of Potatoes, a Pound of Onion, and a Pound of Apples, and twelve Eggs will do. Put six large onions into a saucepan of water, or water and milk in equal proportions, add salt and pepper and boil until tender. When done so they can be easily mashed work them up with butter to the consistency of paste, cover with breadcrumbs, and bake in a moderate oven. If preferred they may be boiled whole, put in a baking dish covered with butter and breadcrumbs, then baked.